He's late teens and looking as hot as York in August. All the girls love this image of the revolutionary artist, forming the brotherhood and working on his smolder. Look at the faint shadow forming on the bridge of his nose between his eyebrows. That deepens as the years pass, but in 1848 he was looking beardless and gorgeous. Millais is an artist who spoke the truth, especially in his sketches, so in the detail sketch on the right, you have a very honest image of the young, flowing-haired man, not completely removed from the very romantic self-portrait. 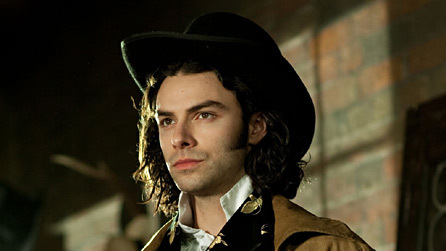 It's possible to discern the curl of his hair on his forehead. I think I better have a bit of a sit down. What a difference a year makes. By 1849, Rossetti has started morphing into a more familiar figure. 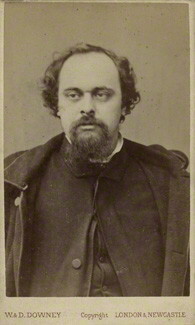 Bearded, slightly unkempt and looking strangely haunted due to the emphasis on the large eyes, Rossetti appears to be whippet-thin and has had his lovely long locks all cut. What a shame. 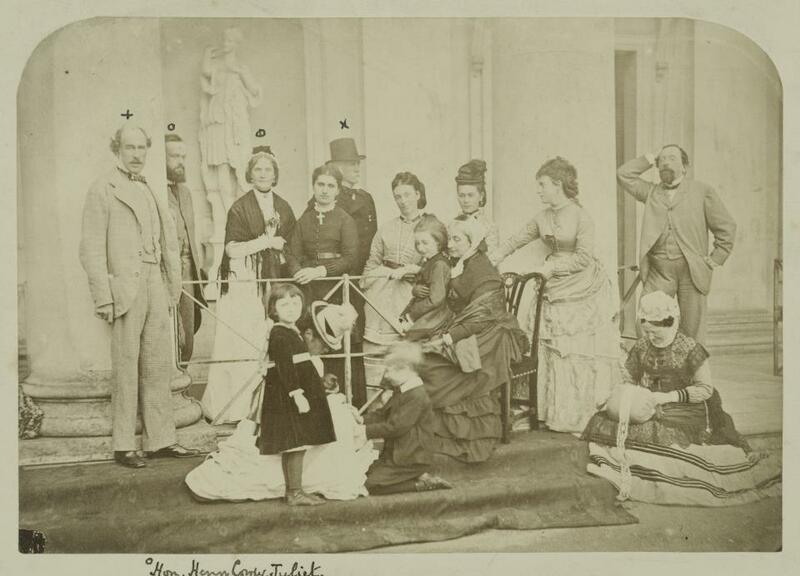 As if you needed concrete proof that by the early 1850s, DGR was not the fabulous-haired cupcake he had been in his late teens, here is a photo from 1853. The brothers look like stray members of a Prog Rock group on a particularly arty concept album cover. He should not have been allowed to stand with his hands on his hips, it's not a good look. Anyway, despite being rather foggy, that outline, the profile, is unmistakable. 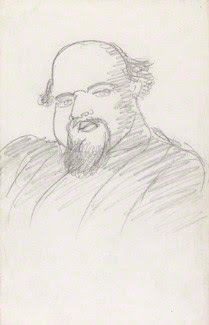 We don't need to squint through the fog, Holman Hunt conveniently did a portrait the same year. The crease on the bridge of his nose is missing, but those enormous eyes glimmer with the sort of intrigue and naughtiness that should make a lady grasp her sixpence. A mere ten months after the death of his wife and their unborn child and Rossetti faces a camera. Put in that context, this just breaks my heart. He looks like his coat: he is holding it all together, but he is slowly coming undone. A year later, and he had settled into Cheyne Walk with a vengeance The series of photographs taken by Charles Lutwidge Dodgson (better known as Lewis Carroll), show Rossetti of the Middle Years, plump and vaguely dapper. 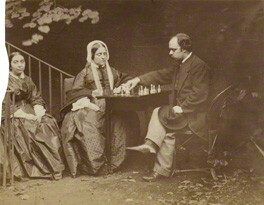 I don't think it is even vaguely ironic that he is pictured playing games with his family. 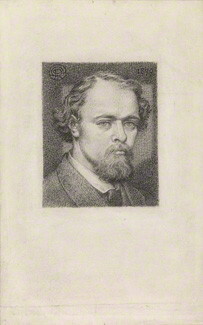 The formality and control appears to have returned to Rossetti in this very self-aware portrait. He looks like someone has actually pressed his clothes for a change. Comparing the image to the year before, you can see how much he has pulled himself back in. He is neat, he is ready and he knows people are looking. In between those two images lies this series of oddities. Really, I don't know where to start with how peculiar this now appears. No, Bell Scott, no-one wants to hold your hand, you horrible man. 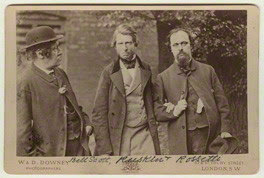 Mind you, Rossetti just got further with Ruskin than Effie did. Moving on. The portraits then become quite same-y for a period. His neatly shaved beard and tidy little suits don't seem to differ even though we know that he went through some appalling emotional upheavals during this period. 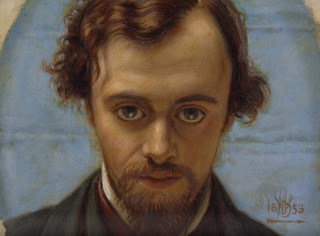 Looking at his self-portrait in 1870, it's hard to imagine this was a man on the brink of a series of appalling breakdowns after the disturbance of his wife's grave. 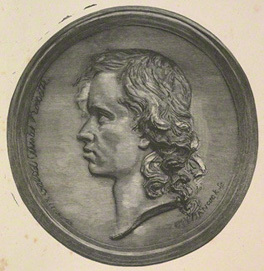 Interestingly, this portrait from the same time by someone else shows a slightly less chipper little fellow. 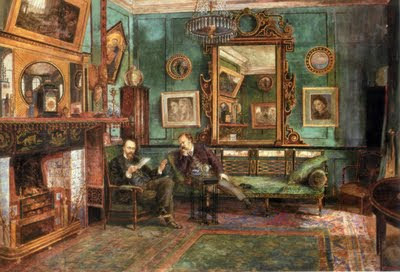 Rossetti didn't like this picture and quickly handed it over to Fanny for her 'Elephant's Hole' of pictures. I agree, I don't like it much either, I find the head to be rather 'skull-like' and that wavy hair is not in evidence. Everything looks ghost-like and haunted all at once. 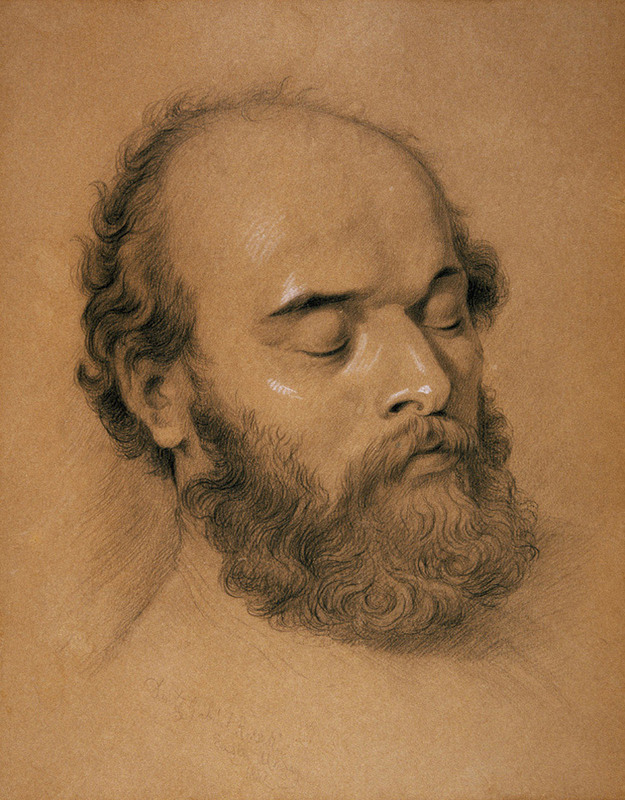 The few lines of this pencil portrait give a very clear picture of the painter towards the end of his life. He looks unravelled, transient, but those large eyes and that line between them catch you as everything else is barely rendered. 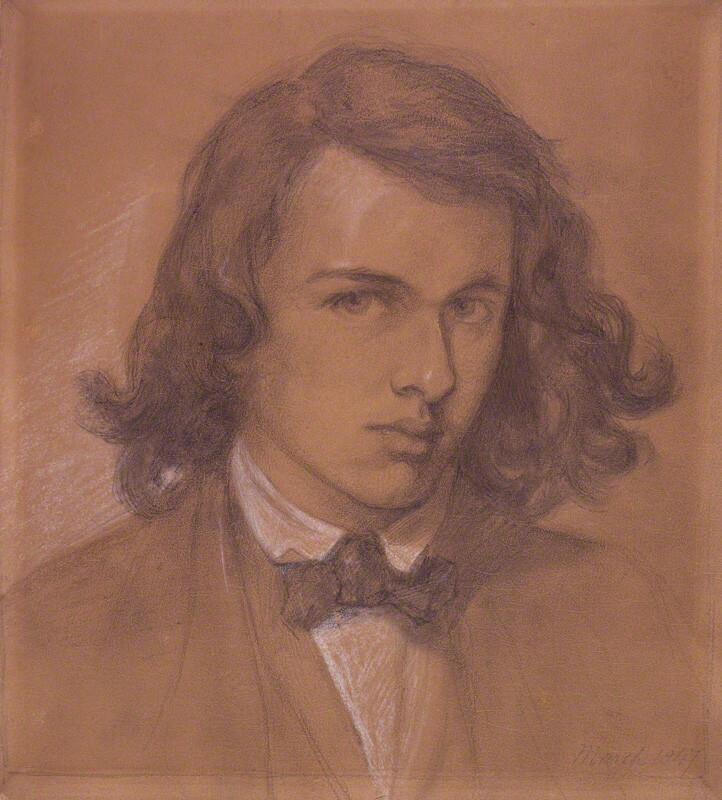 Curious one this, not sure if I believe it is Rossetti, but as we have very little to compare it to, apart from the sketch above, it's hard to call either way. 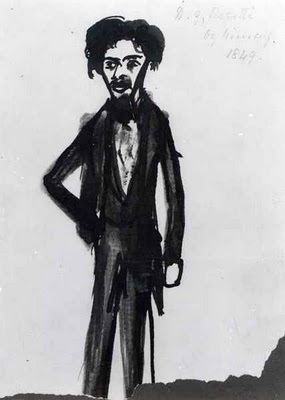 He looks peculiar in the image but then, he was peculiar at this point, having broken with Jane Morris and tumbling into the last troubled years of his life. 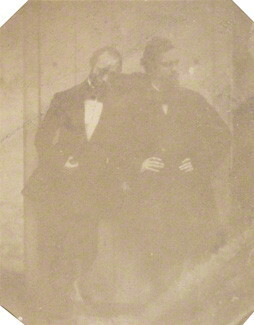 The end came all too soon and despite his wishes not to be recorded in death, both 2- and 3-dimensional renderings were taken. 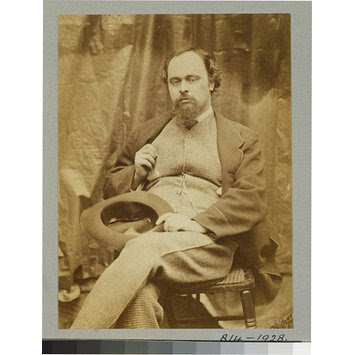 Thinking about the rights and wrongs of the situation, it's hard to accept that my own wishes to see an actual cast of Rossetti's face overrides the man's wishes. I find it all rather heartless, but yet another example of how his family owned him because he gave up control to them too readily. 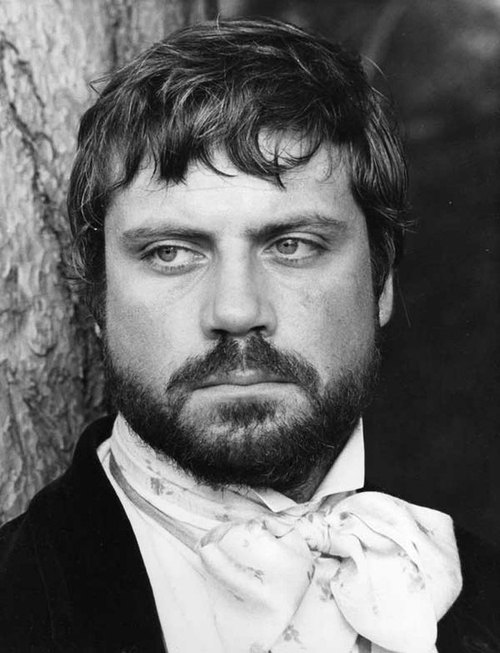 In my humble opinion, Oliver Reed makes such an outstanding Rossetti that no-one else should have bothered. Despite bringing a certain level of hotness to the role, he also brought the charisma. He made you feel irritation, pity and happiness, plus he oozed utter madness. The film is bonkers but I like it because it has courage of its bonkers convictions. Beautifully displaying the youthful enthusiasm of the young Rossetti is Ben Kingsley, a brilliant actor even on his off days. I want to see more than just the snippet on YouTube, BBC, release this soon! 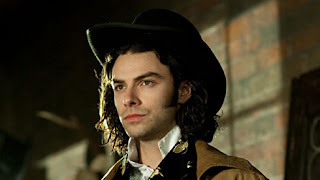 Arguably the portrayal Rossetti would have liked the best has to be Mr Turner's hot gitweasel because Rossetti was a vain man and Aidan Turner is an exceptionally handsome man. 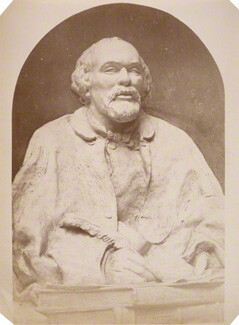 However, the characterization of Rossetti bore as much relevance to the internal machinations of the man himself as Brown's plaster bust resembled the outside. This does him no service and is poor thanks for the beautiful art he gave the world. Shame on you BBC. 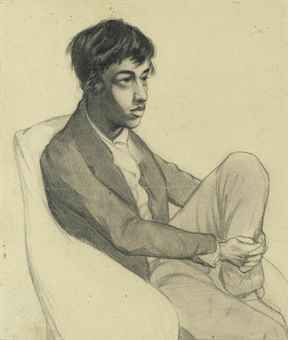 His life was lived in the public eye, reflected and captured in art from his teenage years onwards. 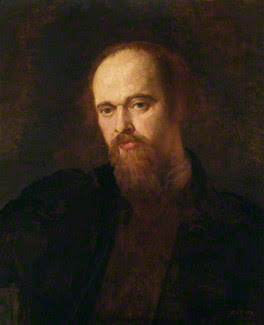 As Rossetti created image from others, he too was flattened and caught on canvas and plate. 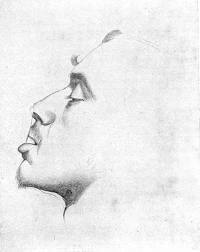 We see him in hope and expectation, we see him in despair, we see him as he cannot see himself and through all of it he stands before us, not shielded by his canvas, not armed with his brush, but waiting for us in a moment that is gone in an instant but will exist forever, a candle that can never be blown out. Fantastic run-through of Mr R's personal visual catalogue. What a brilliant essay and series of images of our beloved DGR. Well done, though I expect no less from you. Fab-u-lous Dha-ling Kirstie your blogs are always full of interest and great photos/picture/paintings. Wonderful, and now I have a crush on the term 'Gitweasel'. I agree, shame on BBC for "Desperate Romantics"... What a travesty. Another amazing selection of images. I actually find myself feeling quite sorry for him, despite his treatment of the women in his life. I have the strange feeling he was never actually 'happy'. 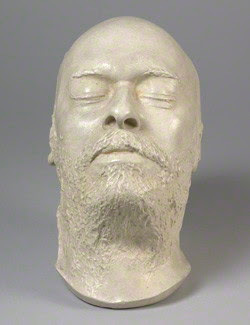 The death mask and portrait I find rather disturbing, but then modern sensibilities about death are far removed from the Victorian ideas. Awesome. Shared. Shared. Shared! Hugs. Thank you everyone! Really, we should make 12th May an international holiday so we can all eat pudding and drink claret together. It's what he would have wanted. Excellent, a Kirsty-mini biography of Rosetti. Yes, we all love the female artists, but with Rosetti being the most famous in addition to in the center of all those tragic and fascinating love-triangles, I think we all like him best. Thanks for a very special post, Miss Kirsty. I'd never seen the death image/mask before and that was fascinating. Agree about the memorial though - that's appalling! 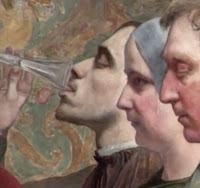 Swinburne, Drugs and Rock 'n' Roll!